Vice Director-General in charge of Antarctic Programs at the Japanese National Institute of Polar Research (NIPR) and professor of geology Dr. Kazuyuki Shiraishi has an interest in the evolution of continental crusts, especially the Gondwana Supercontinent, which existed between about 550 million and 165 years ago and contained the present-day continents of South America, Africa, Antarctica and Australia as well as the Indian subcontinent. As someone very familiar with Antarctica, Dr. Shiraishi visited the southernmost continent for the first time in 1972 and has been back 12 more times since, including three overwinterings. Between 1989 and 1991, he led the overwintering team at Asuka Station, which is located about 70km north of the new Belgian Princess Elisabeth Station. He will be heading back to Antarctica for his 14th visit in February 2010 and will be stopping by the Princess Elisabeth Station. 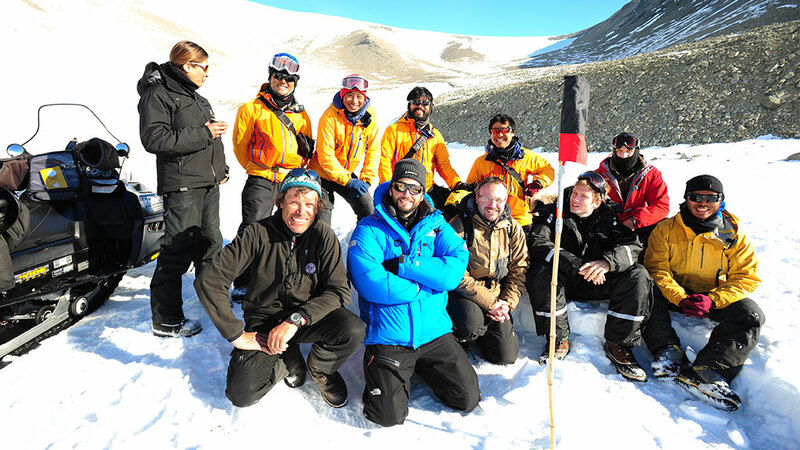 In this interview, Dr. Shiraishi discusses the research Japanese teams have been conducting in the Sør Rondane Mountains as well as the long history of collaboration they have had over the last several decades with their Antarctic neighbours, the Belgians. The Japanese and Belgian cooperation in Antarctica goes back several decades. How did it come about originally? The history of the collaboration between Japan and Belgium goes back a long time. During the IGY 1957-58, Belgium and Japan both established research stations - Syowa and the Roi Baudouin Stations respectively - in the Dronning Maud Land in East Antarctica. In October 1960, members of the Belgian overwintering team visited Syowa Station by airplane and in 1965, and JARE visited the Roi Baudouin Station during the maiden voyage of the Japanese icebreaker, the Fuji. The Japanese and Belgians have spent a lot of time doing research in the Sør Rondane Mountains. Why are they an important place to conduct research? The Sør Rondane Mountains, which are located south of where the Belgian Roi Baudouin Station used to be, is one of the largest mountain ranges in East Antarctica. Belgian scientists made pioneering geological and geodetic surveys here during the IGY. The Sør Rondane Mountains are situated within the continental collision zone where about 650-500 million years ago, two large continental blocks, East Gondwana (mainly Antarctica, Australia, India) and West Gondwana (mainly Africa, South America), collided and amalgamated to form the Gondwana Supercontinent. Based on the geological studies carried out by Belgian and Japanese geologists into the 1980s, geological maps of whole area of the Sør Rondane Mountains were published (e.g. Shiraishi et al., 1997). Geology, petrology and geochemical studies indicated that the Sør Rondane Mountains are divided into at least two different terranes a northeast and a southwest one. A terrane is a fragment of crustal material that forms on one tectonic plate, breaks off and eventually becomes attached to another tectonic plate, so essentially you end up with two parts of land next to each other with different geologic histories. As a consequence there are different protoliths (the original rocks from which different types of metamorphic rocks are formed) and different metamorphic “grades” (how deep in the crust the metamorphic rocks were or how high temperature was in the crust when they formed). The northeast terrane consists of various kinds of relatively higher-grade metamorphic rocks (granulite facies) and have a geochemical signature similar to oceanic and island arc protoliths. On the other hand, the southwest terrane is made up of relatively lower-grade metamorphic rocks (up to amphibolite facies) derived from continental margin products. What kind of research has Japan already conducted in the Sør Rondane Mountains? Japanese geologists have wanted to investigate the Sør Rondane Mountains since the late 1970s. In 1980, I flew over the mountains with a small aircraft and overwintered at Syowa to take aerial reconnaissance photographs. On the way back home from Antarctica, I visited Professor T. Van Autenboer, and he kindly showed me around the mountains. In 1984, a reconnaissance team visited the mountains from Breid Bay and spent a week there. The following season, Asuka Station was built near Seal Rock. From that point on, Asuka Station was actively used over eight years, including by five overwintering teams. During the 1984-85 season, the Japanese conducted a geological and geodetic survey in the central and western part of the Sør Rondane Mountains. Geological, geomorphological, geodetic and geophysical investigations were also performed as well as a search for meteorites. During these expeditions, Professor Hugo Decleir from the Vrije Universiteit Brussel (VUB) and his students participated in the Japanese teams, and the scientific collaboration strengthened between Japan and Belgium. In 2004, three Japanese were invited to take part in the reconnaissance site survey for the new Belgian station. Not long after this starting in 2007, JARE began a three-year geosciences program. What kind of research has been undertaken within the framework of this geosciences program? Japanese field teams conducted geological field surveys in the Sør Rondane Mountains at 2007-2008 (JARE 49) and 2008-2009 (JARE 50) seasons as part of a three-year geology research program (2007-2010). Geological field surveys carried out during the first two seasons covered a total area of 50 km by 150 km. Rock samples collected during these two seasons are currently being studied by geologists in Japan. During the first year, research focused on the central part of the Sør Rondane Mountains. Six geologists and one field assistant traveled with ski-doo around the central part of the Sør Rondane Mountains, carrying out a detailed geological survey. The major goals of the team were to re-investigate the deep crustal processes recorded in the rocks of the mountain range, which are key to understanding the evolution of the Gondwana Supercontinent that existed five to six hundred million years ago. They did this by looking at high-grade metamorphic processes and comparing different areas within the Sør Rondane Mountains, studying structural rock deformation, determining under which circumstances the rocks originally formed (called a provenance study), and determining the age of the rocks and when major geologic collisions occurred. During the following season (2008-2009), five geologists and one field assistant traveled by ski-doo around the western part of Sør Rondane Mountains with the goal of evaluating the magmatic activities that formed the rocks of the Sør Rondane Mountains, and the key activities that established the current tectonic crustal provinces (zones of similar rock type). Research focused on the western part of Sør Rondane Mountains, covering an area of 150 km by 50 km. They investigated magmatism with regards to the formation of the Gondwana supercontinent and deformation process that occurred while it was being formed, investigating the magmatic and metamorphic evolution of the rocks in the mountain range. The current season (2009-2010) is the final year of the three-year geology project. This year the geological field program as well as the geomorphological research program and the search for meteorites is focusing on the central and eastern part of the Sør Rondane Mountains. The geology team consists of five geologists (including one South African geologist) plus one field assistant while the geomorphology team has three geomorphologists, and the team looking for meteorites includes three meteorite researchers (including one Belgian scientist, Steven Goderis from the VUB) and three support staff (one field assistant, one engineer, one medical support person). What are your thoughts about the ongoing collaboration between Japan and Belgium? We are very happy to collaborate more intimately with Belgium because we are neighbours in Antarctica and have a long history of collaborating dating back to the sixties. We used to have the Asuka Station close to where the Princess Elisabeth Station currently is. But now we are planning to dismantle Asuka Station, so we hope to be able to collaborate with Belgium and use their new station. So I think it is a very good opportunity for our scientists. I hope many Belgian scientists can collaborate with Japanese scientists, particularly in the study of the Sør Rondane Mountain area in the geosciences, biology and other disciplines. We are studying the Earth’s geomagnetic field in Antarctica. A Belgian geophysicist installed our instruments last season, and from what I hear everything is going well. And of course Steven Goderis, a Belgian doctoral student, is participating in the part of this year’s Japanese Antarctic Expedition (JARE 51) searching for meteorites. So the scientific collaboration between Japan and Belgium in Antarctica is getting larger every year. We have a very good relationship as neighbours in Antarctica, and hopefully this will lead to fruitful scientific collaboration in the future. You are currently in the process of dismantling the former Asuka Station. How is this going? We hope to have it completely dismantled within a few years. We will have to discuss this with our Ministry of Environmental Affairs, but we will be dismantling the machines and some materials on the site. There is an outcrop where our machines are sitting, so we’ll clean up that area in a few years. We also plan to clean up the old depot. At this stage, we have no plans to re-open the station, which means we will take away all parts of the station in accordance with the environmental protocols of the Antarctic Treaty. Will you be visiting the Belgians at the Princess Elisabeth Station regularly until this clean-up operation is completed, given its proximity to the former Asuka Station? We will if necessary and if possible. What are your thoughts on the Princess Elisabeth Station being the first ever “zero emission” polar research station? We are very interested in how the Princess Elisabeth Station can be a zero emission station. When I visited the station in February 2009 at its inauguration, it was a very good opportunity for me to see the new buildings. There are a lot of interesting devices and instruments. So I am very interested in how these new instruments in the station will work. Dr. Kazuyuki Shiraishi is Vice Director-General in charge of Antarctic Programs at the Japanese National Institute of Polar Research (NIPR) as well as a professor of geology. He has a particular interest in the evolution of continental crusts, especially the Gondwana Supercontinent, which existed between about 550 million and 165 years ago.